A strong interest in protein content and high-protein products across the food and drinks market is continuing to develop, despite the fact that most European and North American consumers already get enough protein in their diets, according to global market research organisation, Innova Market Insights. Innova Market Insights data indicated that nearly 3 per cent of global food and beverage launches in the 12 months ending 31 March, 2014, were marketed on a “high-protein” or “source-of-protein” positioning, rising to 6 per cent in the US. 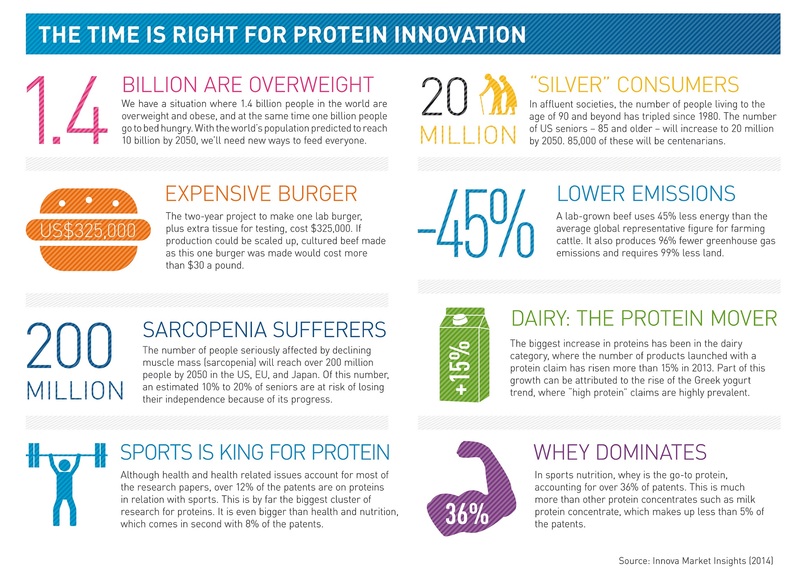 The protein trend has been driven by increasing health concerns – primarily weight management – as well as the move of sports and performance products into the mainstream and targeted at the more generally active, rather than just athletes and sportsmen, according to Innova Market Insights. Another trend on the rise is the Paleo diet, focusing on lean protein, while avoiding processed foods and processed sugars. “We are seeing a lot of new product activity in protein,” said Lu Ann Williams, Director of Innovation at Innova Market Insights. “This week we heard more news about the dramatic increase in pre-diabetes in the US and the UK so companies need to be thinking about solutions,” Ms Williams said. “We know we are facing a diabetes crisis and consumers will need products that help them to manage their health. Protein is an important player in this story,” she said. 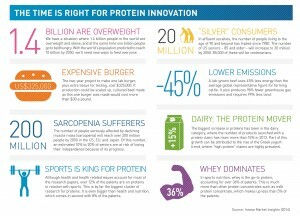 Innova Market Insights said the time was right for ‘protein innovation’, saying that the drivers for such innovation included the need to feed a growing global population, an alarming rise in sarcopenia (declining muscle mass, particularly among an aging population), and the economic and environmental costs of existing protein sources. “Proteins have diverse application potential, with opportunities for alternative vegetarian options, and new protein sources – such as microalgae – alongside existing and novel dairy-based and vegetable sources, such as soy, beans and grains,” Ms William said. Innova Market Insights found there had also been an increase in wholegrain beverages. “Fibre and protein are recognized to promote satiety so this is a great opportunity for weight management claims,” Ms Williams said. Demand for whey protein specifically is soaring as a result of growing demand in certain Asian markets, as well as its rising popularity as a natural, healthy ingredient, particularly in sports, medical and infant nutrition, and in weight management. While vegetables lead the list for the number of published protein patents in food and drinks, whey has risen from eighth position in 2012 to third position in 2013. At the same time, the number of nut and seed protein patents has also risen sharply, from single figures in 2012 to more than 200 in 2013. Even more exciting has been the strong activity in patent actions relating to algae-derived proteins. A recent micro-algae launch into the UK market is Allma’s Chlorella powder, which the Portuguese-based company believes will tap into the trend for protein-rich foods. The powder can be added as an ingredient to multiple food and drink applications, including beverages, yoghurt, ice cream, cookies, snacks and dietary supplements. The company says its product is rich in phytonutrients, proteins, vitamins and minerals and it also has the added benefit of appealing to producers seeking a natural green food colouring. “It’s a new ingredient for the food industry as currently you can only find it as a dietary supplement,” said Sofia Mendonça, the company’s business development manager. “From our research and from talking with producers, we understand that there is a desire for natural and sustainable and versatile ingredients that add value, and which have not just nutritional but also functional benefits,” Sofia Mendonça said. “FrieslandCampina’s Breaker, yogurt in a pouch, has been a successful product in The Netherlands since 2001,” Ms Williams said. “They have recently launched a new high protein version that targets satiety and muscle growth. We expect to see many more of these types of products as well as more RTD dairy drinks that focus on protein. Dairy has always been a health hero and protein is a great fit from a nutrition point of view,” she said. Innova Market Insights said another recent launch in the UK, which hoped to tap into the craze for protein foods, was Men’s Health Fuel Beef Jerky. Described as ‘the ultimate high-protein snack, conducive to a muscle-building, fat burning active lifestyle’, the product forms part of the Men’s Health UK Magazines portfolio under its licensing program. The manufacturer said the jerky was “made with marinated and smoked 100 per cent British and Irish silverside beef”. They also said it “has no added MSG, sugar or sweeteners and is only naturally sweetened with honey and apple juice” and that the high-protein product “has no artificial colours, flavours or preservatives”. This will be one of the key areas addressed by Innova Market Insights at its ‘Taste the Trend’ Pavilion (booth #3651) and the IFT Food Expo in New Orleans, June 21 to 24.